What A Way To Earn A Shilling kicks off when Paul ‘Earl’ Gray hires Private Investigator Frank King to pay off a black mailer who has compromising photos of the singer in Gray's latest group, Jimmy Carter and The Soul Sonic 5. Gray, a violent thug by nature, could easily take care of the business himself and, even though he claims to be legitimate, the assignment mystifies our intrepid Private Eye. Not realising he has been misled from the outset and short of work, King reluctantly agrees to make the pay off. Gray started out by muscling in on the fly-posting racket, before moving into management. Now, he's big stuff in the music business with a roster that includes the rock band Thunderflash, whose records sell by the shed load. Gray’s persona doesn't pose a problem for King, as he grew up with men like this and knows how to handle himself. The story is set in Southeast London during the swinging sixties, when a £100 in the right police station could buy anything, except murder - that was extra. These were the good old days, where even the heads of the Flying Squad and the Serious Crime squad were bent. What A Way To Earn A Shilling hearkens back to a time when there was an Empire and Britannia ruled the waves, and the whole world swung to Greenwich Mean Time; just as the teenagers of the day were swinging to the sound of Britain’s first wave of Brit-pop music. Frank King is a gumshoe who is on the up and will bend the rules when the need arises, but he will never knowingly break the law. What A Way To Earn A Shilling's fast moving story weaves its way through South East London with a page-turning edginess and contains a rich seam of real life characters. 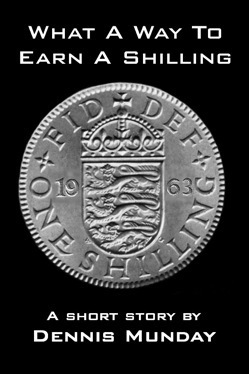 What A Way To Earn A Shilling is part 1 of ‘The Shilling’s Trilogy’. Part 2 is entitled, For A Few Shillings More and Part 3 is entitled, All This For A Florin. All three novels are set in South East London, during the mid-sixties and feature Frank King. Mr Munday does a nice job of introducing/re-introducing the reader to the not so “swinging” side of 60's SE London. The characters are believable and well thought out with enough “background” material to give them life. The use of “real London” language and catchphrases makes a Londoner feel at home and should provide some fun entertainment for non-natives to decode. The engaging plot and “twist” story line run at a good pace and the inclusion of descriptions ranging from clothes, cars, and pubs provides additional feel of the time. I especially enjoyed the “views” of the city...I can see it now. Nice one John! Look forward to the next one...hope to see Mr King again. I stumbled upon ‘What A Way To Earn A Shilling’ via Dennis Munday's big seller, ‘Shout To The Top’. I discovered a really tight, well structured story. It's heavy on the use of dialogue, not easy to get right at the best of times, but works extremely well. I 'got' all the characters and was particularly intrigued by the inner workings of Frank King. Over the course of just 12,000 words, I knew what he was thinking and understood his motives. The build up to the exchange in the park had me viewing the action in a filmic way; was visualising all the action Love the pay-off of the final sentence. Excellent stuff. Think What A Way To Earn A Shilling would make a really good series of 'Frank King' short stories - I shall keep checking back for the next instalment! A fast moving short story with nicely developed scenes, characters, and a touch of nostalgia. This held my attention and made for an enjoyable commute - unfortunately only three days worth though, so looking forward to more: As other reviewers have said, it does leave the reader with a feeling of more to come and a series of Frank King short stories would be great! Munday strikes a perfect balance between narrative development and character exposition, each evolving effortlessly from the other. There is a vibrant exposition of location, both in time and space, with a local’s knowledge of, for example, the South London hostelries of the era, brought to bear. The characters are three-dimensional and convincing, and occupy a literary space that oozes atmosphere and style. Above all, it is ENTERTAINING – we want to know what happens to Frank and his pals, and enemies! Greatly looking forward to ‘Another Shilling’ or ‘Bob’s Your Uncle’ or whatever – maybe Frank could get the odd job abroad – ‘Knight In Tunisia’? Drawing on his past and experiences, Dennis Munday has produced a crime noir novel that not only pays homage to the music industry and the underworld of the sixties, but also tips a wink to the traditional gumshoe detective in a style reminiscent of Raymond Chandler’s Philip Marlowe. The key figure in this story is Private Eye Frank King, a man in his late thirties, residing in South East London. We learn from the opening pages, that he suffers from pyrophobia a fear of fire induced by an accident he encountered earlier in his career. No medical or counselling seems to have helped him, and the only way to confront his demons is via the anaesthesia of marijuana and whiskey. Yet he is far from a loser, he hides these demons from his peers, dresses in sharp Italian suits and has an eye for the ladies who find him equally as attractive. He is a complex man, with good dress sense, just the way we like our Private Eyes. His work is his religion, and when top heavyweight Band Manager Paul ‘Earl’ Gray asks for King’s help to pay off a blackmailer, who is holding a set of intimate photographs of one of his acts. Images that could damage his career he steps in despite being puzzled as to why this well known gangster ‘Earl’ doesn’t want to deal with this episode himself. ‘Earl’ claims he is going straight, and cannot be seen to be involved and King becomes dragged into an intricate web of deceit. The story is well written with attention to detail to the changing landscape of the sixties, the corruption within the Police, the fashion at the time and the dark side of music. ‘What a Way to Earn a Shilling’ is a tour de force, pure pulp fiction and a perfect read on Kindle.